Topics: Services, Virtual Cfo, Bookkeeping & Accounting, Tax Returns, and Payroll. Its 2 nameservers are ns1.lcn.com, and ns0.lcn.com. 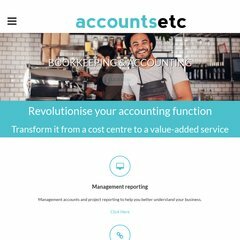 Accountsetc.co.uk's server IP number is 94.126.40.154. PING webforward.lcn.com (94.126.40.154) 56(84) bytes of data.